The new Sky Sports Power Rankings have been published today. The Power Rankings methodology reflects a player’s performance over the last five Premier League rounds of matches by awarding points to players for 32 different stats. A heavier weighting is given to the most recent match in descending order to the fifth last one, with the intention of showing who is most in form. Newcastle’s recent form, including the contribution of certain individuals, has seen four NUFC stars feature in the top 24 positions of the top 50 Sky Sports Power Rankings published on Monday lunchtime. “Newcastle duo Ayoze Perez and Jonjo Shelvey stormed into the top 10 after a 2-1 win at Leicester. 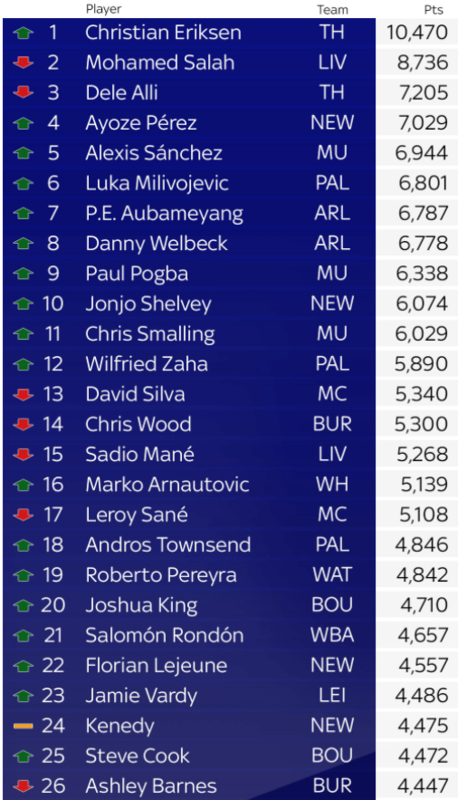 So the top of the power rankings now has Eriksen at the very top, then Salah, Alli….Perez! As you can see, Jonjo Shelvey’s form has also pushed him into the Top 10, whilst Florian Lejeune (great display and an assist on Saturday) is at number 22, with Kenedy at 24 making up the NUFC quartet.